We had the opportunity to create some unique works of homeschool art thanks to an innovative product called Master Kitz The Starry Night from Kidzaw.com. We were sent an Amazon Gift Card via email with which to purchase the kit. Once it arrived, we were so excited to get started. First of all, it came in this nifty carrying/storage case. Almost everything needed for the project was included. This gave us enough supplies to make two paintings. We were also gifted two extra sheets of paper, so all four of the children were able to create their own Starry Night masterpieces. There was actually just enough paint to be able to complete two additional projects. We were also supposed to supply some sort of palette, plus tape to keep the paper secure. As we didn't have any paper plates at the time, I took wax paper and taped it to a regular plate. It worked perfectly. I will mention that after opening the kit, we did wait til the next day to start our project. The paper and stencil came rolled up, so I rolled the paper the opposite direction and set it back in the box overnight, and I attached the stencil to our easel. This really did help to flatten the paper, though the stencil was still sort of bowed. As I had four children working on their own paintings, we did this in two stages. The first day, each child worked individually on art while the others were involved with other subjects. They worked through the first 10 steps, which are all painting steps, and then their papers were set aside to dry. The next day they worked on the final details using the oil pastels. Let's take a look at the process we followed. Amelia was the first one to work on her Starry Night painting. As you can see, we kept the instructions in easy reach, and we covered our work area with newspaper. The first step is to attach the star sticker masks. The children can place them wherever they want on the top half of the paper. We love how this helps to personalize the projects. We started with blue paint. I used the picture in the instructions to give them an idea of what the texture should look like. They were reminded to move up and down the page while rolling back and forth. I was noticing that if they went back and forth in one spot too much, the picture lost the textured feel that it is meant to have. You can see what I am referring to in Hannah's painting in the picture below. The white paint was used next, we figured it was supposed to go mainly in the middle of the picture, though the instructions didn't really specify. Of course, it mixed with the blue paint, as we were told to just put in on the top of the blue paint on the palette, so we had more of a light blue than a white. It was now time to remove the star sticker masks and tape the stencil down to the newspaper so we could add the black paint. We noticed this worked best when we used very gentle pressure while picking up the paint as the foam roller rolled easier. However, when placing it on the painting, the children really needed to push down hard to get the paint to go through the small openings onto the paper. And yes, because the stencil didn't quite lie flat, I helped to hold it down. They also had to be careful in a couple of places where the connecting pieces were quite thin. There is one spot where it did end up tearing after the first two uses. Fortunately, it wasn't too difficult to place the loose section in the right spot for the children to complete their painting. I will also mention that we made the mistake of trying to wipe it down with water after the first use. That was a mistake. You can see the places in the picture above where the water ruined the stencil. I will also say that technically the kit was designed for two paintings, so it did live up to that expectation. And, it might not have ripped if we hadn't tried "washing" it. Once it was completely covered in black. . .
. . . we removed the stencil. We let the paint dry before moving on to the next step. There was a suggestion to use a hair dryer to speed up the drying process, but we didn't have time to work on the final details the first day anyway, so I decided we would wait until the next day. Though we don't own a hair dryer, I do believe the paint was drying fast enough that we could have worked on it if we hadn't had other school work to finish. I know the first two were dry by the time the last one was painted. The children gathered at the table and used the included oil pastels to work on the details. Tabitha actually brought her own oil pastels to the table to add some additional color. They worked on giving the stars a swirly feel, and then added color to the fields and buildings. Here are their finished Starry Night paintings. The children loved working on this art project, and we were very happy with the results. It was definitely a unique way to create a replica of this famous painting. Though, I will admit, you don't really get the feel of how Vincent van Gogh actually used the brush strokes to get the famous effects. Speaking of Vincent van Gogh, we did enjoy learning new information about his life from the enclosed informational fold out. This unfolds once to show this interesting flowchart with more information. And then we unfold it again to find the instructions (which I shared a couple of pictures of earlier in the review). I highly recommend this innovative art kit. It was great fun to use with the children, and they loved the results they achieved. I admit, I was a bit nervous about the paper and stencil being rolled up in the box; however, the paper straightened quite well and as long as there is someone to help hold down the stencil, it is not a huge problem that it doesn't lay flat. So, if your children (or yourself) would like to have some fun creating art and learn about a famous artist, I really think you will enjoy this kit. I haven't told the children, but I am thinking of getting another kit or two for Christmas. Or maybe even birthdays. Tabitha said," I think it is a fun way to do art and learn about Vincent van Gogh. My favorite part was when we got to do the oil pastels to finish up the drawing because I like doing art for myself, so I'm not a big fan of using stencils, but it was still fun." Amelia said, "I enjoyed using the art kit. I liked the colors in the oil pastels, but I really wish there was a little more colors. And I liked the van Gogh roller. It was fun." Hannah said, "I liked the painting, but I don't like that it was all rolled up because then it was harder to use the stencil." Harold said, "My favorite part was how we got to use the rollers. I liked the one to roll the black on with the stencil best." You can find Kidzaw on Facebook, Twitter, and YouTube. 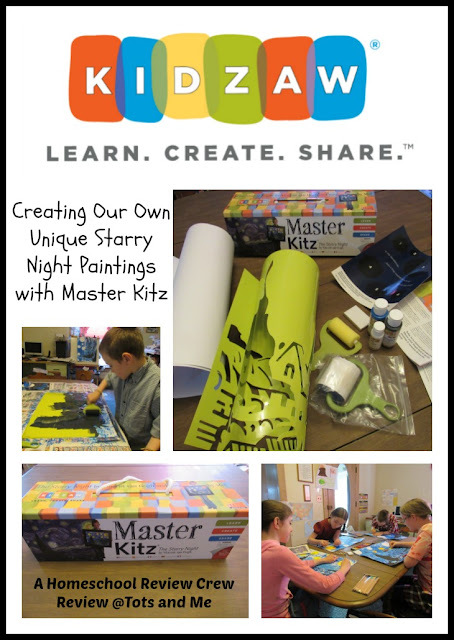 Don't forget to click on the banner below to see what my fellow Crew Mates and their children thought about the Starry Night Master Kitz from Kidzaw.